Fountains generally perform aesthetic functions. When they are placed in urban spaces the intention is often to bring an oasis – an experience of nature, into the city. Observing and listening to fountains can be a mesmerizing and contemplative experience, but the repetitive patterns can also seem arbitrary and without meaning. 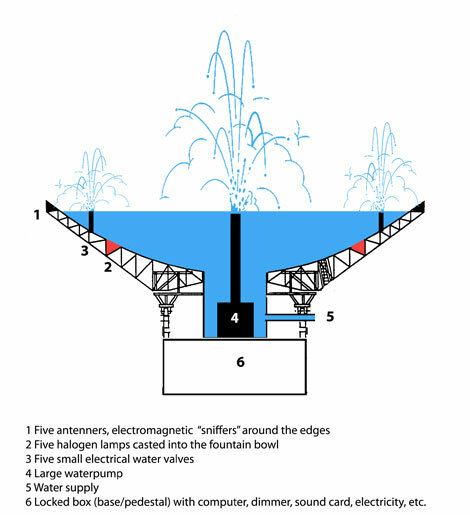 The dancing water of the Electromagnetic Fountain is neither predictable nor random. It draws on data derived from the detection of electromagnetic activity in its immediate surroundings (wireless technology such as mobile phones and surveillance equipment, tram lines, traffic lights, antennas, etc) to control the dynamics of the rise and fall of its water jets. In other words, it is the electromagnetic nature of the city that is reflected in the fountain. Like the wind, it is invisible. Unlike the wind, it is not often perceived or reflected over. By gazing at the fountain, the ethereal body of the invisible twin-city is revealed in a poetic and enigmatic way. The fountain is constructed in a portable format. A redundant satellite dish forms bowl. It is approximately 2.5 m in diameter that rests on a pedestal of about 45 cm high. It has been acquired from Norway’s most prominent TV transmission tower that looks out from the hills over Oslo. It became redundant when analogue TV transmission was closed down to make way for digital signals. The fountain is equipped with devices for detecting and digitizing man-made electromagnetic activity in the near vicinity. This data is used to control electric water pumps and valves so that the water jumps and drops to evoke the feeling of the incoming data. Underwater lights that also react to this data illuminate and colour the fountain at night. All equipment is stored and secured in the fountain’s pedestal, out of which comes one cable for connecting to a power supply, and a nozzle for filling and draining water. i wanted to contact you earlier but …time passes, water flows…. below some info about a project i am initiating. Maybe you might be interested to partake/contribute? it will be ‘live’ on internet around mid-feb in its primary version…with events on March 3,4 and 5. there is a FB group you can come to if you want.just reading your article ‘a call for attention’ in the ‘Program to perform’…great! 2011: Waterwheel is turning! Welcome! Be a part of this new online collaborative space without borders: from teachers to students, performers to scientists, producers, programmers, curators, visual artists, composers, activists and everyone in between. All ages welcome! Waterwheel project revolves around water – what you want to share, say, or debate about this fundamental element. Waterwheel interactive website will give you the power to collaborate, explore ideas, research and gather feedback by uploading and sharing media about water: images, video, music, text or sound. The Tap online performance & collaborative venue is accessible by audience and performers with just a click, no download needed, and is free. ‘Live’ performers from various locations will interact with audiences in real time using webcams, media from The Waterwheel and drawing tools. Audience can participate online through a chat facility or directly with the ‘live’ performers on site. From February, basic versions of The Waterwheel and The Tap will be available: you can be involved and follow the developments by uploading your media, exploring the online venue, and giving your feedback. Fountains are outcomes that anyone is free to initiate and are triggered by interactions on The Waterwheel. A Fountain could be a book, a performance, an exhibition, a community project, a multi-generational exchange, a concert or an installation festival – let your imagination steer the way. These Fountains will be mapped out on the website, so you can see how The Waterwheel is growing. Throughout 2011, workshop residencies will develop one Fountain which is an installation performance, testing the website and the online venue. The first residency, which runs 14 Feb – 6 March, is based in Brisbane and open for your participation online or on site. Please let us know your interest. Turn the wheel your way and pass on this message to your pool of people! You are welcome to translate it into your language.